Mix the lukewarm water with the yeast and sugar and let rest for 10 minutes. Add oil and salt and sift the flour over the mixture. Knead the dough 10 minutes on a flour dusted work sheet until it is very smooth and no longer sticks to your hands. Let rise for 1 hour on a warm spot. Knead the dough short but firm. 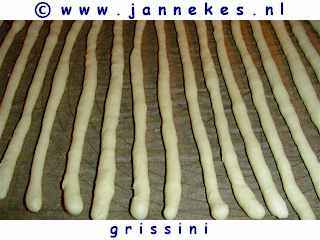 Rol bits of dough between your hands to long thin stems. 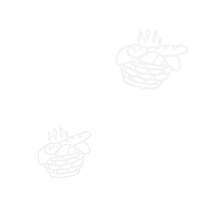 Place with some distance (they'll double in size) on a greased baking sheet (or use baking paper) . Let the stems rise 1 hour on a warm spot. 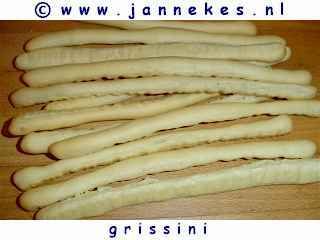 Bake the grissini golden in 10-12 minutes . 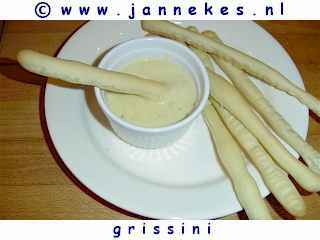 Serve with soup or cheese sauce (and try: stir a spoon mustard through the sauce) .